When I logged onto my computer and opened Facebook on Thursday Morning I knew something dire had occurred with a Cincinnati Firefighter. The local news sources were indicating that a Firefighter had been gravely injured while fighting a fire in an apartment complex in Madisonville, a Cincinnati, Ohio neighborhood. Although the news reports were calling his injuries grave, other comments made by individuals who would have access to such knowledge indicated his injuries were fatal. I kept up with the news reports, hoping the individual reports would turn out to be incorrect but unfortunately that was not the case. Early Thursday morning on March 26th, 2015, Firefighter Daryl Gordon fell to his death in a fall through an open elevator shaft in the apartment building. I feel certain that the residents of the apartment building did not know they would wake in the early morning hours to fire and smoke. I feel certain that Firefighter Daryl Gordon did not know that he would be running into an apartment building filled with fire and smoke. I feel certain he did not know he would give his life on this day. The difference between the residents and the firefighters was the residence only wanted to get out, and the firefighters only wanted to get in. Their focus and intent was to extinguish the fire and save as many lives as possible. The firefighters were successful in their intent. There were no civilian casualties to the fire, and the fire was extinguished before it could spread and cause further damage and danger. The firefighters ran into the building and did all that could be done to save lives and save property. All but one came out. 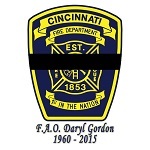 Firefighter Daryl Gordon was 55 years old and had served the city of Cincinnati as a firefighter for 30 years. He lived a hero’s life and he died a hero’s death. Recently it seems the focus of dangers on the job have been about on police officers killed in the line of duty. We rarely hear of a firefighter line of duty death. Approximately 20 firefighters have been killed in the line of duty in the United States this year and it has been 12 years since the last Firefighter line of duty death occurred in the City of Cincinnati. Of course, just because it happens less often does not make it less tragic. My heart goes out to the family and friends, and to the firefighter community who will be so tragically impacted by this untimely death. Firefighter Daryl Gordon died a hero. He died for us. Let us never forget the risk each and every firefighter face each day they go to work. The most amazing part of all of this is that even though this tragedy has occurred, no firefighter will hesitate to report to work and face the dangers of the profession to protect all of us. When you go to bed tonight, sleep well and secure in the knowledge that heroes like Firefighter Daryl Gordon are on the job and willing to put it all on the line to keep you safe. I salute you Firefighter Daryl Gordon. Thank you for your service. Firefighter Daryl Gordon Memorial Fund has been established at Kemba Credit Union. You can donate to the fund at any Kemba Branch. Fyi….given you love for our police chief, I have to tell you that I was disgusted that he didn’t come to the hospital. Daryl Gordon may not have been a police officer, but he was still part of the police family. And I can say for certain that Chief Blackwell did not respond to the hospital – I was there until the body was transported to the coroner’s office.